Despite going down a man in the 24th minute, the Seattle Sounders powered past the Colorado Rapids Sunday to claim the No. 2 seed in the Western Conference playoffs. 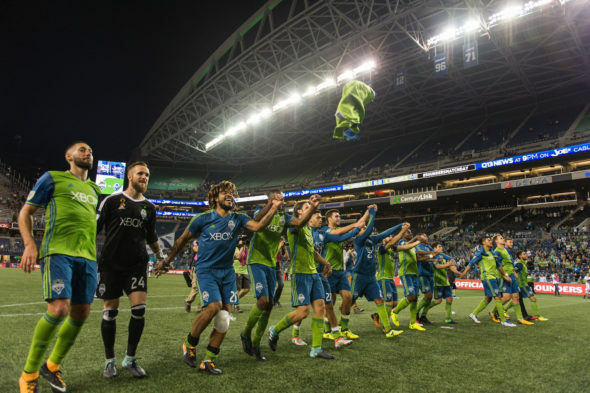 Despite losing Clint Dempsey to a red card in the 24th minute, the Seattle Sounders blanked the Colorado Rapids 3-0 at the Clink Sunday to clinch the second seed in the Western Conference playoffs and a first-round bye. The red card means Dempsey will miss the first leg of the conference semifinals against an opponent to be determined. Seattle (14-9-11, 53 points) finished the regular season behind behind the Portland Timbers (15-11-8, 53 points), who earned home-field advantage throughout the playoffs by virtue of the first tiebreaker — most wins. The Sounders play the lowest remaining seed after midweek knockout matches between No. 3 Vancouver and No. 6 San Jose, and No. 4 Houston and No. 5 Kansas City (MLS playoff bracket). The Sounders start the first leg of the conference semifinal on the road, either Sunday Oct. 29 or Monday Oct. 30, before returning to play the home leg Nov. 2, to avoid a conflict with the Seahawks game Nov. 5. Next week’s time off will help Seattle, which had four regular starters out due to injury Sunday. Osvaldo Alonso (quad strain), Jordan Morris (hamstring strain), Gustav Svensson (hamstring strain) and Victor Rodriguez (quad strain) were excluded from the 18-man roster, while Brad Evans (lower back) is reportedly out for the season. Coach Brian Schmetzer was concerned about the potential shorthandedness. “It’s massive,” Schmetzer said. “We need all the help we can get. My mantra has been next guy step up. We’ve dealt with it. That’s a resilient group. Seattle went on top in the ninth minute, when Kelvin Leerdam found Will Bruin inside the six-yard box to provide Bruin’s third goal in the past two games. Dempsey was sent off for swinging his arm into the head of Mike da Fonte. Referee Chris Penso showed Dempsey the red card after reviewing footage of the incident using the league’s new Video Assistant Referee. Colorado (9-19-6, 33 points) had a chance to equalize 52nd minute, after a bouncing ball struck Harry Shipp’s hand and led to a penalty kick. But Dominique Badji’s kick bounced off the right post before being cleared away by Leerdam, preserving Stefan Frei’s 13th shutout this season. Seattle stretched its lead in the 63rd minute when Nicolas Lodeiro scored from the penalty spot. A video review led to Penso sending off Axel Sjoberg for hauling down Bruin in the box and Lodeiro beat Colorado keeper Tim Howard to the right side of the net. Lodeiro added a final score in the fourth minute of stoppage time, chipping the ball over a diving Howard after a long run. The second seed is the highest spot claimed by a defending MLS Cup champion since 2010, when Real Salt Lake equaled the feat. Schmetzer reminded his players of their perseverance from last year’s improbable championship run. “I’ll have to think back about exactly how we won playoff series against quality opponents,” Schmetzer said. “I believe in the way we train the team. I believe in the way we play the system that we have. I believe in the players themselves. If you have a good routine going, and you’re confident in your abilities as coaches and as players, you’re not going to win every game, but you’re going to give yourself a good chance. so sounders have to play 1st playoff game with 10 v 11? way to go, clint!